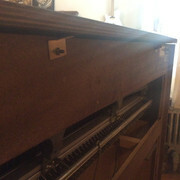 I just got my hands on a Maestro 612P, and I can't seem to figure out how to take off the lid to take a look at the hammers, reeds, and other mechanics. I took off the back panels (see image), but that doesn't give me access to everything. I've removed the screws that attach the little braces that secure the lid to the back (see image), but the middle part of the lid still seems to be attached. Has anyone had any luck with this? Does the lid even come off? If not, how can I access the guts? Thankfully, the reeds sound pretty good unplugged (I have to clean the volume pot and maybe some other troubleshooting to get the amp working), so hopefully all is well under the hood. Sent you a message, but here are some pics that might help. The lid slides backwards after the two wingnuts are removed. There is a grounding wire that is attached to the lid in the left middle area. The connector just pulls free.You should be able to remove the lid after that. 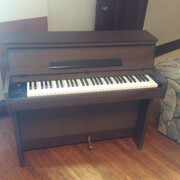 Also thought I'd mention, if the piano is not producing sound from the amp, the amp most likely needs attention. I replaced the caps in both my 612p pianos. They both had issues in the voltage multiplier circuit. I replaced all the caps just because they were most likely well past their expected life. These are just like wurlies and have high voltage across the upper rail, should be somewhat low current, but be careful regardless. Amazing, thanks. Had to slide it pretty hard, but I got it off! Now that I've cleaned everything up, it's time to troubleshoot the amp. The volume pot is definitely less scratchy, but I'm getting hardly any volume. I can hear it come in at about an 8 on the volume dial, but it's still super quiet when it's cranked all the way. Any idea what that could be? Caps? 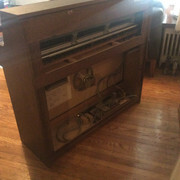 I'll probably have my tech come over to check it out regardless because I have a feeling he'll want to play around on it, but let me know if you have any ideas as to what it could be. The volume pot doesn't do much more than turn the unit on on my units. The volume increases a little bit, but mostly stays at what I would consider a mid to high(ish) level. I remember someone else commenting on theirs behaving the same . As far as what is wrong, that could be anything at this age. Typically capacitors are well past their expected life, so I always look there first, especially on the voltage regulation portion of the unit. Others may argue, but I believe in replacing all the electrolytic caps just because they are way beyond their expected life. It is up and running! The problem was that the reed pickup rail was only getting about 60V, which was almost half of the standard 150V. I had some power supply components replaced and, voilà, back up to full voltage. But my next question: Have you figured out how the headphone jacks work? I'm only able to get left or right with either jack individually. I bought a splitter (1/4" female to 2X 1/4" male mono) to try plugging headphones into both at once, and it works — kind of. I have to pull the cables out slightly so that the tip is just connecting to the socket; this gives me both ears, but there's also a lot of background buzzing coming from the cables not being totally snug in there. Any ideas?